Daniel Griffin, Two Roads Home (Calgary: Freehand, 2017). Paperbound, 334 pp., $21.95. Daniel Griffin’s Two Roads Home is a reimagining of the 1993 Vancouver Island logging protests. In this version, instead of playing out peacefully, the protests culminate in protestors who, frustrated by getting nowhere with peaceful methods, plant a bomb and (unintentionally) take a life. They then scatter, and variously hide, go off the grid, cooperate with authorities, and deal (or resist dealing with) the consequences of their actions. Griffin sketches complex characters—the activists display both a relatable (and, for the most part, reason-tempered) passion and conscientiousness alongside moments of sometimes sweet, sometimes eye-rolling naiveté. 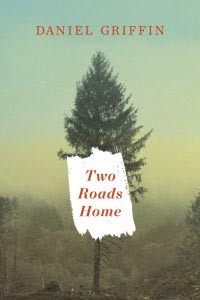 An accomplished short-fiction writer, Griffin has a talent for setting scenes where two people talk to one another in short bursts, letting the reader uncover the differences between the various characters and their relationships through their chosen words and how they react to one another. This technique is more or less successful, but it can slow development somewhat when unnecessary scenes (was this originally envisioned as a short story collection?) creep in. The digressions are naturalistic, but too frequent, and not always compelling. For example, there is a moment fairly early into the novel where two characters see a dog. One tells a story about the childhood dog she grew up with. The other does not directly engage or respond to this story at all, but tells a different story about the breed of dog. We learn about the characters a bit here, and I suppose conversations often go this way, with people waiting to speak rather than listening and responding accordingly, but I feel as if the author, confident in his ability to create realistic dialogue, is expecting it to do the work that plot and development should be doing. Make no mistake, however; when he focuses on moving the characters forward, the dialogue in this book is mostly strong. I hearthese characters speak, and that’s a very good thing. They just don’t always speak about things that advance the action. This lethargy plagues the novel. Despite the explosive and thought-provoking subject matter, the book is slow to develop. Griffin does not seem to trust the reader to move along with the characters, and so often restates the various problems forthe reader and overexplains the interrelations of the characters. At over two-hundred pages in, the activist responsible for actually planting the bomb—Pete (going by the alias “Ash”)—hides in a colony of forest-dwelling squatters, not really having dealt with any consequences for the bombing yet. He meets a kindred free-spirited woman, an artist, and the two develop feelings for one another. The woman muses to herself: “Painter and stranger meeting in the forest, falling in love, making a life together. This very thing was now happening to her, and yet some niggling doubt held her back, some worry she couldn’t quite finger. Maybe that Ash was younger than she was? That she knew so little about him? That is was all so rushed? That they had no money?” Well, sure. Probably those are some doubts that niggle. Although she does seem able to finger them here pretty easily. And needlessly, as we’ve been reading along and understand where these doubts come from. Simply relisting them doesn’t do anything except pad out the sections between conversations and deliver on-the-nose exposition. But the real problem with these linking sections is that Griffin reverts to oversimplified drugstore-prose quick descriptions so that he can get back to dialogue. An example from later in the niggling-doubt section: “Ash was handsome enough, youthful with a rugged air that attracted her.” And then Griffin uses “niggling doubt” again on that same page. Given his flair for dialogue and his expertly crafted settings—in his descriptions of the forests and the water, especially—I can’t help but feel that Griffin can do better. As it stands, however, the novel can feel rushed and uneven, with moments of brilliance between long stretches of the author not trusting the reader to perceive the subtleties. This is a shame, because there are some great lines running through the book. The various ragtag bands of characters are all interesting in their own ways, with quirks and foibles that elicit both sympathy and indulgent snorts. Pete’s development is slow, but sustained and interesting. Even as the forest woman is falling for him, Pete is self-consciously aware that in order to protect himself, he is willing to abandon and even steal from her. Pete is a rare character, he is by turns callow and caring, sacrificing and selfish. He has profound depth and promise, but the novel ultimately leaves many of his complexities unexamined in favour of more surface-level considerations.